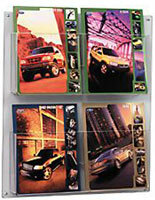 1-1/2" Deep brochure pocket holds several leaflets. 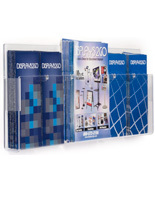 Acrylic construction coordinates seamlessly with commerical settings. Removable, peg divider to change the size and number of pockets. Pre-drilled holes make wall-mounting easy. 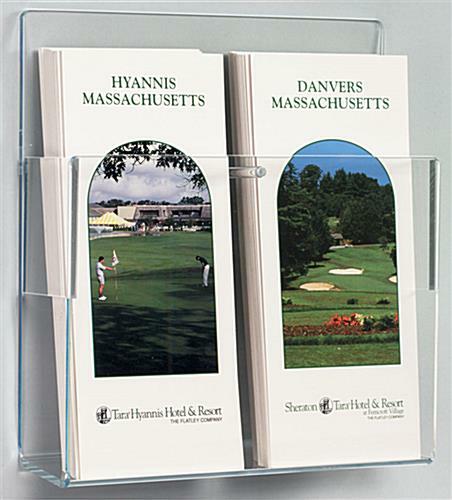 This brochure pocket holder has a time test design and incorporates additional features that set it apart from similar products offered by competitors. What makes this magazine rack better than most units? 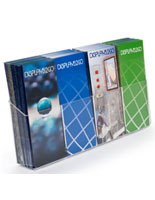 This brochure pocket holder, also known as a literature display, comes with a removable divider! 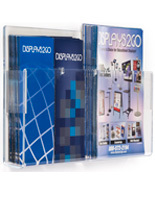 As a result of the removable peg divider, this rack holds either a single stack of 8.5" x 11" magazines or two stacks of 4" x 9" pamphlets. The brochure pocket has a depth of 1.5" to store thick stacks of pamphlets. 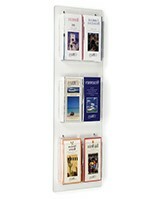 Another feature that differentiates this unit from other literature racks is that it features an acrylic construction. The acrylic fabrication is completely transparent, which provides customers with a full view of literature stored within. The back of this brochure pocket has two holes for wall mounting. 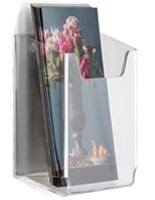 Due to the acrylic fabrication, this unit should be mounted indoors only. 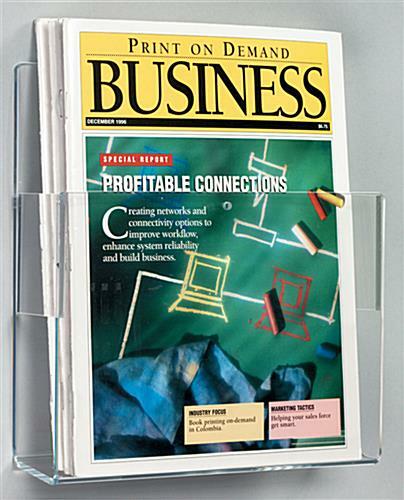 Many businesses mount this display next to a checkout register or by an entrance to offer customers promotional literature. Medical offices use these pockets to offer patients recreational and informational literature to read while in the waiting room. 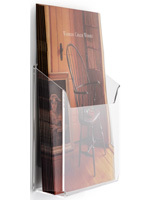 The balance of quality construction, affordable price and adjustable design makes this unit a great choice for displaying literature in any setting! 8.3" x 14.5" x 1.8"